“Choosing the correct officiant for our wedding was of great importance to us, as the ceremony sets the tone for the whole event, in our opinion. Richard had come highly recommended to us, and at our first meeting we understood why. He was very natural; we could tell he had genuine interest in getting to know us and what we were looking for on our special moment and day. Over the coming months we corresponded quite regularly and met again to discuss further aspects to the ceremony that were unique to what we were looking for. “Richard gave us an amazing ceremony. He incorporated our own personal themes and values into the service and we felt like we had a marriage ceremony that really represented us. Several guests said the ceremony ‘was so Alex and Jonah.’ We come from different religious and cultural backgrounds; using our input, Richard was able to create a ceremony that both sides of our family were very happy with. “We were very fortunate to work with Richard Meyer as our officiant on our wedding day. We found him to be an incredibly warm and genuine individual. He provided two consultations prior to the day of the ceremony, which were very helpful. Overall, he alleviated our concerns and worries about everything going smoothly, and the day of the ceremony went perfectly. “We chose Richard Meyer to be our wedding officiant at our ceremony at Viansa Winery in Sonoma, California. Since we didn’t know Richard before hiring him, we met him a month before the wedding so he could get to know us. He asked us a few questions and then asked us to send an email to him in the ways in which we love each other. “Thank you for everything; we are just starting to unwind from such a beautiful four days of family and celebration. Thank you for being part of it all, and for putting us at ease with the knowledge that such a high quality individual has administered our vows. “My husband and I had only a short time to plan our wedding before he deployed to Iraq. 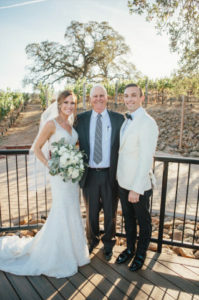 His family is from out of state, but we knew Sonoma County’s Wine Country was the ideal spot for our wedding ceremony. We asked Reverend Richard Meyer to marry us, and despite short notice, he didn’t hesitate. “I can recommend Richard very personally. He’s my father, and a wonderfully sensitive, caring, thoughtful and accepting individual. I’ve witnessed him officiate wedding ceremonies for both of my sisters, and he did it with ease and just the right amount of emotional involvement. He’s funny when appropriate, and yet understands the gravity of what he’s doing, helping two people commit to each other wholly and completely in front of their loved ones.